Oliver Stone has assembled a terrific cast for his latest offering, and it certainly sounds like it has the potential to be one of the finest crime-thrillers of the year. Headed up by Blake Lively, Benicio del Toro, Aaron Johnson, Taylor Kitsch, John Travolta, Uma Thurman, Emile Hirsch, Joel David Moore, and Salma Hayek – essentially, more talent than you could lawfully ask for – we now have our first look at the excellent first poster. A great first image of Lively and del Toro surfaced back in January, and this poster gives us our first look at some of the other characters, including Kitsch, Hayek, Travolta, and what looks to be Thurman (potentially in a mask celebrating the Mexican holiday, the Day of the Dead – though don’t quote me on that). I’m a big fan of Lively’s, and was happy to see her gain significant recognition for her role in Ben Affleck’s The Town (if you haven’t seen it, you must as soon as possible), and I’m hoping that this will gain her even further recognition. The film is based on the novel by Don Winslow, best-selling crime novelist, and has been adapted for the screen by Stone, Shane Salerno, and Winslow himself. 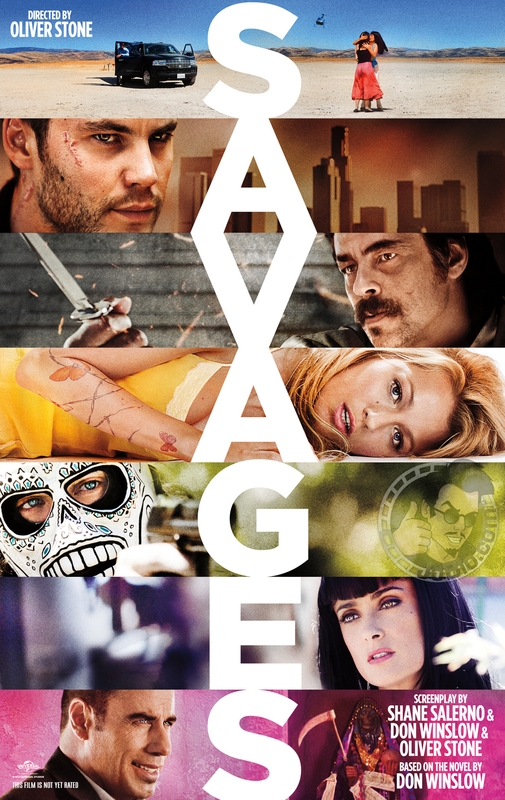 Savages is due out in the US on 6th July, and will be coming to the UK a little later for a 28th September release. I have a feeling it’s going to be immense. As usual with this awesome first poster, you can click to enlarge.